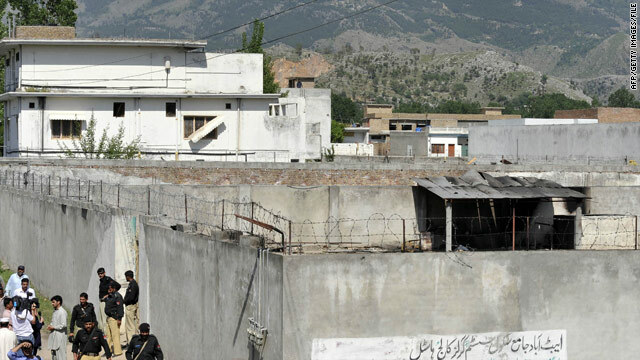 The U.S. stealth copter crashed in Osama bin Laden's Pakistan compound. [Updated at 12:02 p.m.] Chinese military engineers likely got to examine the wreckage of the U.S. stealth helicopter that crashed during the raid on Osama bin Laden's compound in Pakistan, according to news reports. "We have reason to suspect China was given access, but we cannot confirm it definitively. We have strong suspicions," a U.S. official told CNN. Pakistani intelligence operatives likely gave the Chinese access to the wreckage, the New York Times reported, citing American officials and other intelligence sources. The Chinese engineers were able to photograph the wreckage and take samples of the stealth skin that helps the chopper avoid radar detection, intelligence sources told the Financial Times. When the aircraft crashed during the raid that killed the al Qaeda leader in May, Navy SEALs destroyed most of it to protect the technology. But the tail section remained mostly intact and it was that area that the Chinese engineers examined, according to the New York Times report. U.S. intelligence is basing its opinion that the Chinese got access to the stealth copter on intercepted phone conversations, the Times reported. Pakistani officials contacted by the New York Times refused comment on the matter. The Financial Times said a Pakistani official denied the accusations. Both newspapers noted that China and Pakistan enjoy a longstanding military relationship. The raid that killed bin Laden, staged without informing Pakistan, stoked tensions between the U.S. and Pakistan. In July, the U.S. said it was withholding $800 million in aid to Pakistan. "They've taken some steps that have given us reason to pause on some of the aid which we're giving to the military, and we're trying to work through that," White House Chief of Staff William Daley said at the time. This is not the first time an "allied country" has helped steal american technology and given it to our enemies. @Charming: So? Your point? It's ok, because someone else has done it before? You'd do great in Washington. This is your destiny calling you. Americans cant even keep the illegals from crossing the borders, let alone stopping Chinese invasion. You know they have already seen it. If it fails the look and smell test, you know what it is. The sad part is the State Dept and Congress will probably give them another $1B in aid money....that we borrowed from China. China and Pakistan dont need to attack us militarily. We are going to defeat ourselves with repeative Washington stupidity. I think China already knows it. They just have to wait. I have zero confidence that Washington will do the right or the smart thing. American's are unwilling to do what's needed in order to get back to what made us great. Many parents are horrible. They will allow their kids more play time instead of telling them that they need to work a bit more at school, so they can have a good job and compete against other country's children in the job market. Really the most fun a person can have in life is as a child and as a wealthy adult. Maybe if kids knew they could be filthy rich like their favorite entertainers by going to school then they would try harder. I still blame parents though. They shove so much garbage down their kid's throats and wonder why they grow up into dysfunctional adults.. duhhhhh. Yet we keep giving money that we don't even have to Pakistan. We are idiots. Soon we will be dead broke and in political chaos idiots. But hey, let's keep voting for the same old system and making fun of the "Tea baggers" why stop the train to oblivion now? We give money to Pakistan (not billions as is the myth) say about 300 million since we announced a package of 5 billion & nothing more after the Osama killing. I have yet to see any other ally in this war sacrificing & suffering so much. they did all this once before for us when the Taliban ( then we called them freedom fighters) and Pakistan collaborated with us to drive out the Soviets from Afghanistan. Get your facts straight guys. As long as we keep wars and military conflicts going in these countries we risk such incidents. Just cuz you use "US" and "OUR" in your comments doesn't hide the fact that you are either pakistani or a pakistani US citizen lobbying Washington for Financial AID, stealing technology or a sleeper cell. Screw Pakistan and China. Time to make new relationships and friendship with their enemy > India. I bet a step towards India which is peaceful and reliable country would be brow-raising for the world. As both India, US don't like and trust Pakistan and China. America does not have friends, America has interests. We gave China the rope, with which they will hang us, keep buying MADE IN CHINA. The Pakistanis play both sides of the coin, a failed state with nukes whose people are still in the 15th century. We gave them f-16's and guess who they sold one to, so they could copy the technology? I'll take India over this failure that calls itself pakistan (small letters). As this paranoia about China shows just how ignorant the American people really are! One would think that in this day and age the people would know better. The right-wing fanatics did their job, I see, in brainwashing the public into believing their mumbo-jumbo!!! You owe them money, if you don't pay, they take. Screw china...revalue your freaking currency and quit hacking our computer systems your communist idiots. Funny how 50 years ago we would have had nothing to do with a nation like china but now we are the crack feans looking for the cheap fix. Their products are junk and we buy it especially wal-mart. They laugh at us all te way to the bank. What I do not understand is how any american company could allow our products to be made in china and they are using the money we provide their economy against us. why arent we being americans and building things here ourselves. forget the relationship with Pakistan. bomb them too. get the war over. all or nothing from china and Pakistan. Time for America to be American and stop trying to coherce or bargain with people that are doing us wrong. I say axe all foreign aid to Pakistan, not just military assistance, but civilian aid as well. Considering that they continue to be at the very best of times a reluctant participant in counter-terrorism activities, and at the worst, they outright support terrorism, we should consider them a hostile nation. We don't need to assist them when our drones can operate from airstrips in Afghanistan or other ME states to strike targets in Waziristan. If we outsourced our military weapons productions to China, we can cut our defense budget by 80%. Instead of pay $2000 for a screw, we would be paying 20 cents for one. Instead of paying $500 for a toilet seat, we can just squat and save the $500. Pakistan is an ally and China is a State Sponsor of Capitalism that all our Corporations are out sourcing jobs to.